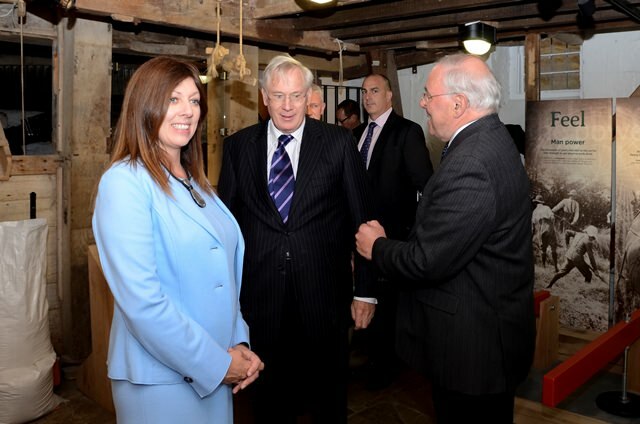 The team at Sacrewell were delighted to welcome HRH The Duke of Gloucester to the visitor centre last week. His Royal Highness officially commend Sacrewell Mill, which reopened after a £1.8m restoration project in July, and was given a tour of the 18th century grade II* listed building, which pointed out the work that had been completed with the help of the Heritage Lottery Fund. Local dignitaries, staff, volunteers and the trustees of the William Scott Abbott Trust joined HRH aferwards for tea and cake in the cafe, where he unveiled a plaque and was presented with an artist’s impression of the restored mill by our chairman, Paul Hutton OBE. HRH told the party that it was a pleasure to visit Sacrewell again and to see the great work the Trust is doing towards agricultural education. He emphasised how lucky we are to live in such a picturesque part of the country, and how vital small charities such as ours are in preserving our heritage. Mill Project Officer Jane Harrison, who headed the project, was delighted with the afternoon’s events. She said: “It was a beautiful afternoon and HRH The Duke of Gloucester was able to see the mill at its very best. We were milling at the time and welcomed a group from Ravensthorpe School, who were making the most of the mill’s educational facilities.